Last night I covered the first of many Nintendo 3DS games to be reviewed this month, the second annual month of 3DS reviews! It was a digital game, much like this second title to be reviewed, Bloo Kid 2. 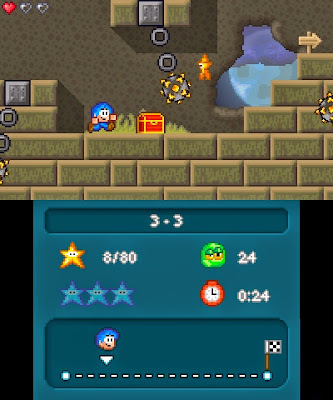 The original Bloo Kid, released on mobile devices, is not for offer on the Nintendo 3DS. Hopefully that will change, as this sequel on the Nintendo 3DS (also on mobile devices) is quite the enjoyable romp. See how with my review. Once every little while a game comes out of nowhere to surprise me with its quality. When I decided to review Bloo Kid 2, a game that originally released on mobile devices, I didn't think much of it. I knew it was a game in my favorite genre, but I didn't expect it to be anything above average. Fortunately, the old colloquialism "you can't judge a book by its cover" comes in here. Well, in this case, we're talking about judging a game by its screenshots, but that is neither here nor there. Bloo Kid 2 manages to successfully hearken back to a bygone era in gaming. While that is nothing original by itself, it doesn't have to be. Instead, Bloo Kid 2 puts fun over originality and day of the week. Bloo Kid 2 is an old-school style platformer through and through, whether it is in its visual appearance, sound effects and music, or complexity. Bloo Kid himself has very little moves in his arsenal, making for a game that is accessible to nearly everyone. He can jump, double jump, bounce off enemy heads, and swim. That's pretty much the extent of Bloo Kid's repertoire. It's the actual level design that keeps Bloo Kid 2 from feeling stagnant. surgery for lazy eye, right? With Bloo Kid 2's levels, you get sprawling affairs with plenty of split paths that eventually converge to a return to a more linear path, plenty of hidden areas uncovered by walking through invisible walls, and tricky enemies to contend with. The levels are short enough that repeated play-throughs don't come across as tedious. Depending on the difficulty chosen, Bloo Kid has more or less hearts to work with than normal, the basic health bar of the game. 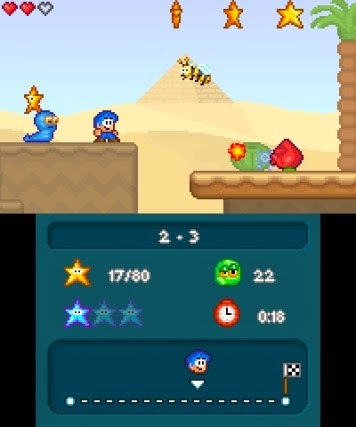 If you're hit when you have zero hearts shown, it's game over, and you have to retry the level from the very start. Again, level length allows for fast runs through them. It's just when you get to meticulously exploring levels (a task that is completely optional, but adds longevity to Bloo Kid 2) that the amount of time it takes to beat a given level is longer. The enemy variety in Bloo Kid 2 is quite high. 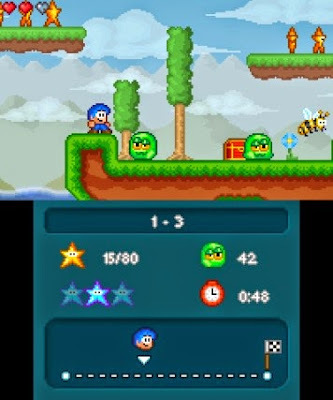 There are nine levels in each of Bloo Kid 2's five worlds, the final being a boss battle that is highly reminiscent of bosses from other games. For instance, the boss of Green Hills, the first world of the game, is pretty much Whispy Woods from Nintendo's Kirby series. This is even down to the way it attacks and takes damage. Each level has its own set of goals to complete, but you can simply rush through a level and beat it if that's all you want from the game. However, it's through completing the six goals of each level where you get a better satisfaction out of playing Bloo Kid 2 and more appreciation for the game's level design. For instance, one goal is to collect all of the stars in a level or defeat every enemy. 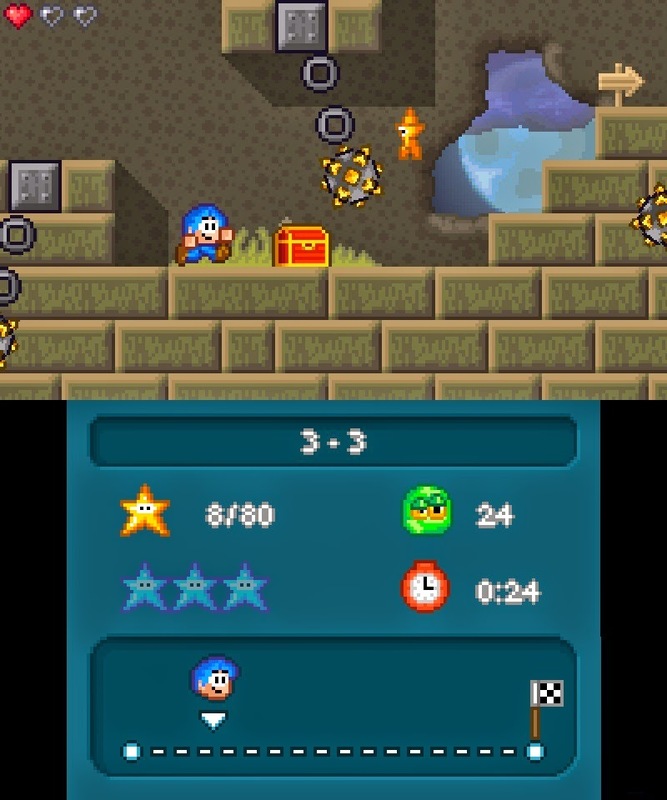 There are also three hidden silver stars in each level that require some fanatical devotion to acquire them all. Not just because they are hidden well, but also because many require careful and cautious platforming to attain. 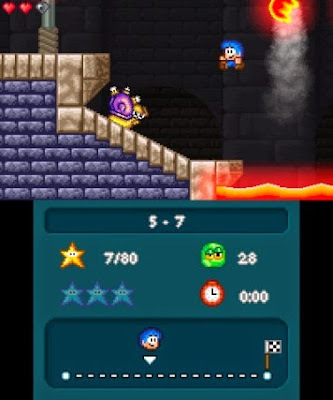 Despite a blue flower indicating a silver star is nearby, there is some a lot of searching to be done, whether it's through hidden walls or death-defying platforming prowess. Other goals include beating the level before the timer hits zero, completing the level with full health, and hitting the rising balloon at the level's goal before it escapes the screen. that it was inspired by 2D platformers of old. Bloo Kid 2 features color pixel visuals that look like a nice compromise between what one could find on the Super Nintendo and what one could find on the Sega Genesis. The 3D effect is pronounced but imperfect. Bloo Kid and the platforming environment have the same depth, but some platforms are further back in appearance in 3D. This makes it so Bloo Kid occasionally looks like he's standing on midair. Other than that, the 3D effect works well and looks great. The music is chiptune goodness that sometimes had me bobbing my head around as I played. The only problem really with the game's technical performance is that it crashed on me once in the fourth world, resulting my Nintendo 3DS system to go back to the home menu and restart. to go for a dip in that lava! Bloo Kid 2 doesn't attempt to do much that is original, but that's okay, as what is here is exceptionally fun. The level design houses an abundance of secrets, allowing players to comb over every inch for hidden areas, as well as the option to speed run with ease. The ability to play with physical buttons instead of a touch screen setup is a marked improvement, making a nicely designed game play even better. If you're tired of searching for an inexpensive 2D platformer that does its job well, Bloo Kid 2 won't give you the Bloos. Review copy provided by Winterworks.